Do Cats Make Better Pets Than Dogs? 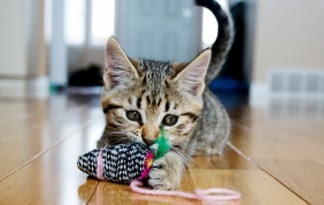 Cute kitty playing gently with its toy. Keep in mind that a dog is still writing this blog, ehem, and I think it's ridiculous to even think that a cat might make a better companion than say, a sweet boy like yours truly. But the good folks at Animal Planet beg to differ, and have penned this hilarious "Top Ten Reasons" why cats supposedly make better pets than dogs. Don't even get me started: Is it so awful that I jump on everyone who enters my home, insist on going for long daily walks, or bark loudly at each living creature who dares to walk by my home? Come on! Awww a pillow buddy. Must pop over and take look. Have a terrific Tuesday. Looks just amazing, I like such style and wish to have a similar constantly, despite the fact that that may be super hot sometimes. I am always prepared to talk about that stylish things and aspire to talk about style eventually somewhere within the magazine. However, I attempt to see grab my essay reviews day to day and improve my ability as a copywriter.